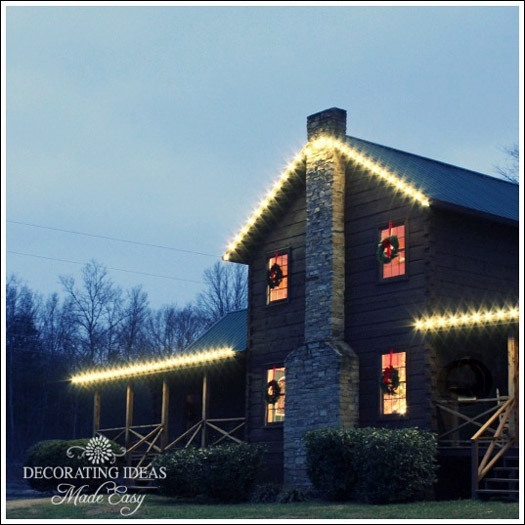 We are excited to bring you ideas from our blogger friends for your Christmas outdoor decorations. See what they did, how they did it and how it all turned out. 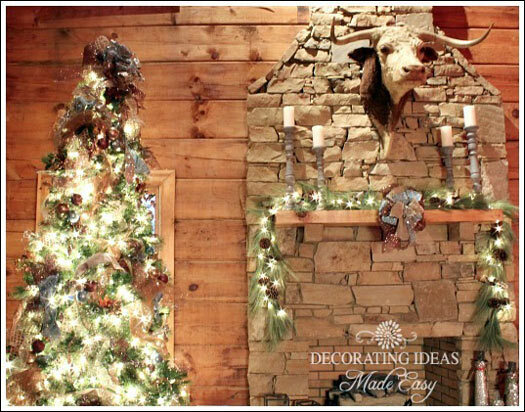 You might just find your next best Christmas decorating idea right here. We start with Clydia's tomato cage Christmas trees and then you'll get to see Betsy's screened porch decorated for Christmas. Using an urn, a pot, a small evergreen wreath, a tomato cage and some gardening tape, Clydia created Christmas trees for her front porch. And they are so cute. 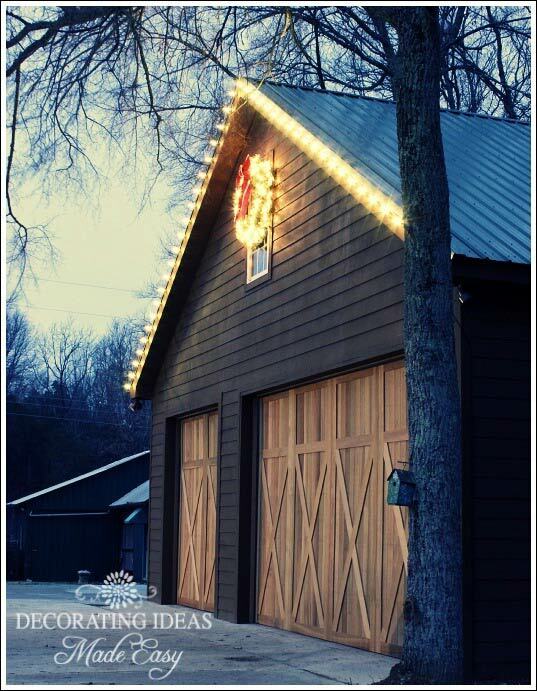 What a fun outdoor Christmas decoration. 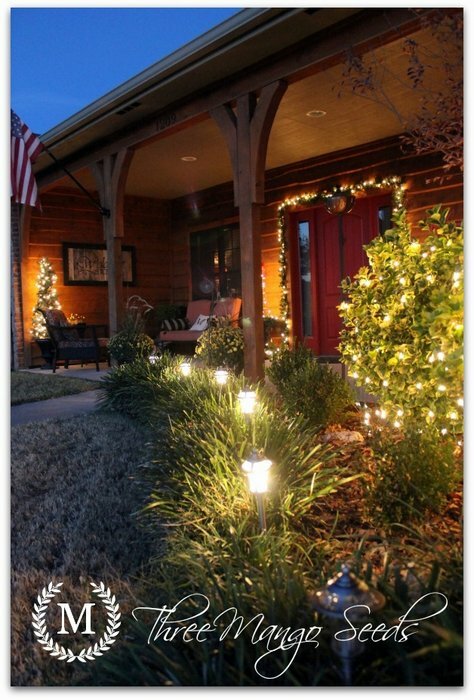 Topped with a red bow and outlined with white twinkly lights, these little "trees" add real charm to her Christmas porch. Clydia has made these Christmas trees from a tomato plant frame once before and learned some tricks of the trade along the way. One of those tricks was to add one or two large rocks to the bottom of the pot to keep the tree from being blown over by the wind. She shows pictures and detailed instructions on her site. Clydia's decorations are simple and beautiful. See how her Christmas trees decorate both sides of her front door? I love the beauty of the white lights and can just imagine a quiet snowfall. 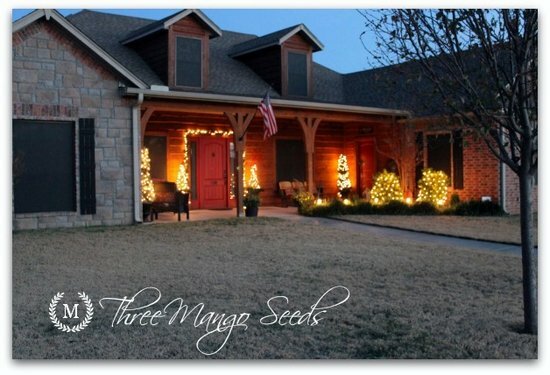 Clydia is the author of the DIY blog, Three Mango Seeds, and the creator of rustic signs for your home. 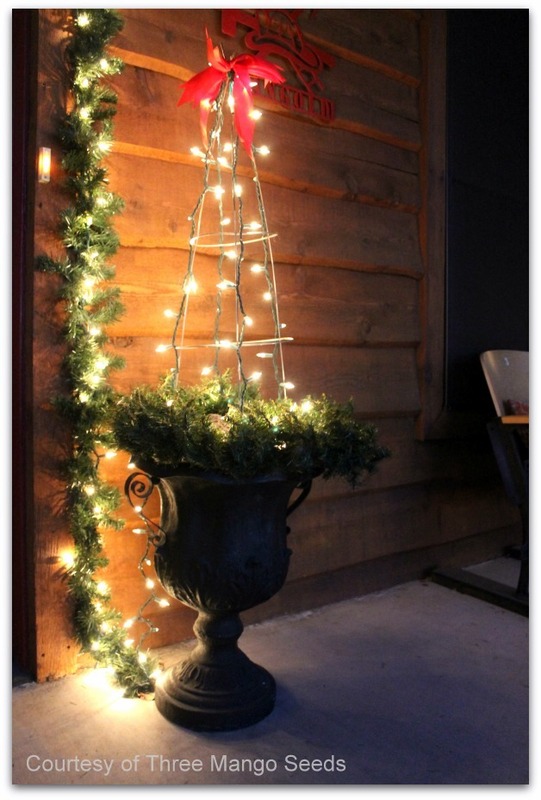 Please stop by her blog to get the full instructions for making these Christmas trees for your porch. She has some handy tips to save you time. Clydia's Christmas porch is twinkly and bright and ever so inviting. We love the feeling of being at a cabin - such an enchanting home. 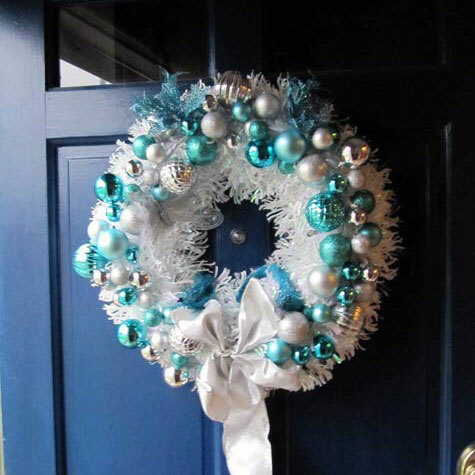 We appreciate you, Clydia, for sharing your Christmas decorating tips with us. Betsy has her screened porch all set for Christmas. Can you believe that her wonderful screened porch used to be only a deck? She and her husband didn't even have the fireplace. 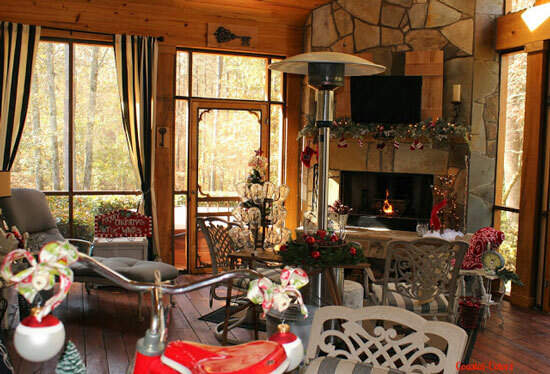 Betsy's stone fireplace is such a warm addition to her screened porch. The garland going across her mantle is quite sweet - with snowflakes and little mittens tucked in. Oh, yes, snowmen, too. Betsy adds something new to the garland every year - a tradition that we like. This year it was iced-branches. In the foreground you can see a small old-time tricycle that Betsy is using as a centerpiece. Betsy's porch is ultra relaxing. There's a pond within earshot of the porch. Can you just imagine the soothing sounds you would hear? That's a vintage window you see atop her coffee table. And do you also see the three old-time electrical conductors? 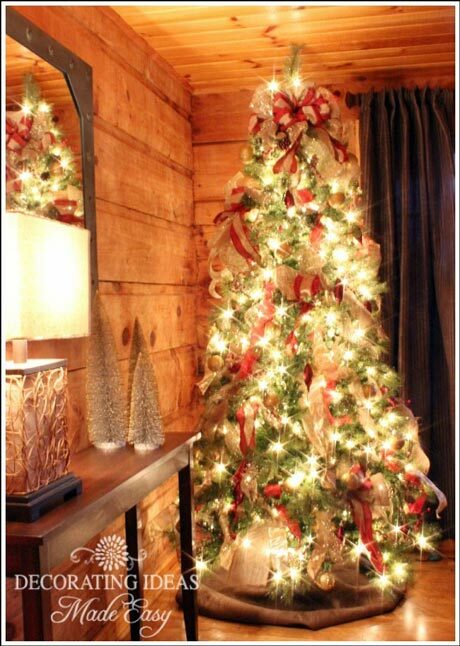 What a delightful idea for Christmas decorating. Some years she puts tea lights in them instead of the ornaments you see here. 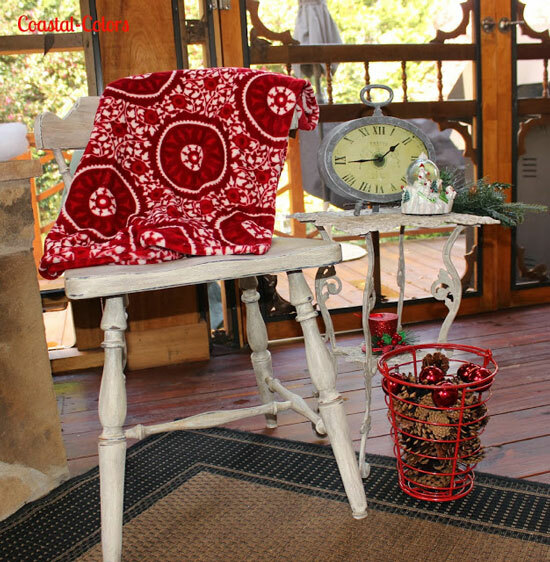 We appreciate Betsy's knack of making her porch so cozy for Christmas with pops of red and vintage charm. I like the red egg basket that she filled with pine cones (the scented kind) and shiny red balls. Betsy is the author of Coastal Colors. 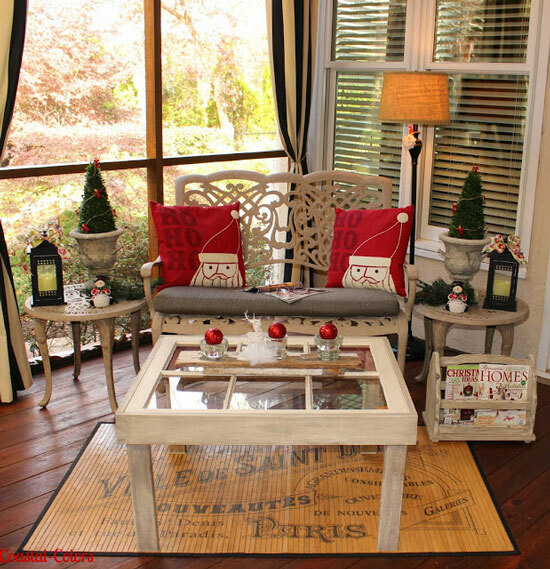 We are so happy that she shared her Christmas screened porch with us. 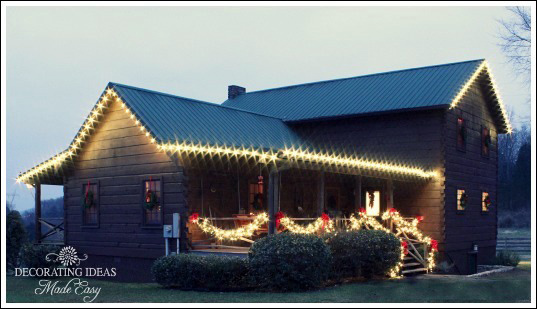 Please visit her blog to see many more pictures of her sweetly decorated Christmas porch. 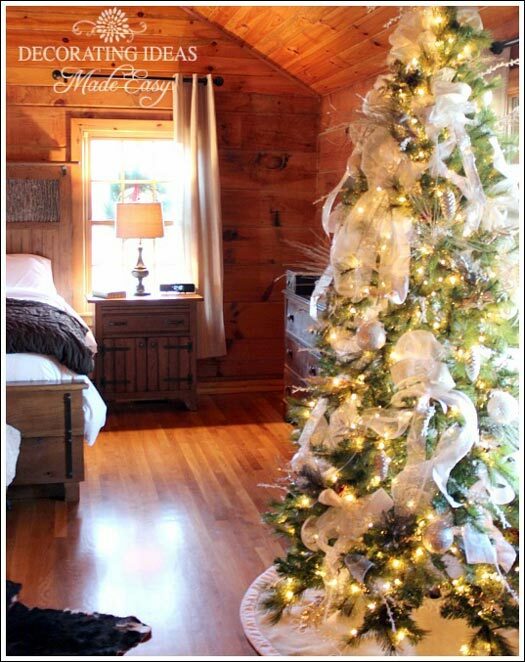 Our friend, Jennifer, of JenniferDecorates.com, decorated this wonderful log cabin for a client of hers. She graciously shared these photos with us. We hope you enjoy them as much as we do. 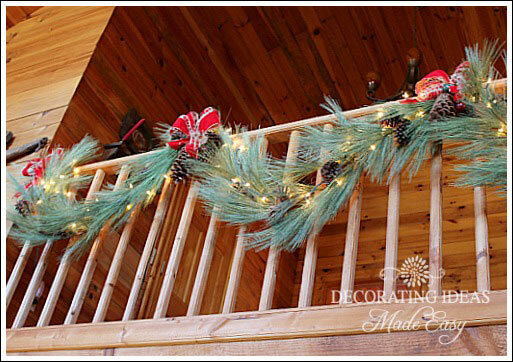 See how these Christmas wreath decorations add immense appeal and maximize garlands and valances.